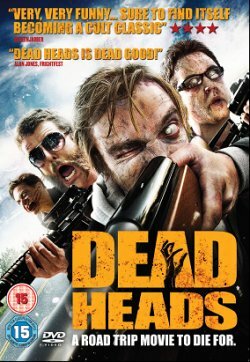 After a hugely successful UK premiere at this year’s FRIGHTFEST, DEAD HEADS comes to DVD & Blu-ray 2 January 2012 with a whole host of extras. Directed by brothers Brett and Drew T. Pierce, son of THE EVIL DEAD special effects photographer Bart Pierce, the film wears its influences gloriously on its blood splattered sleeve and sees a return to 1980’s style comedy adventure movies like BACK TO THE FUTURE and GOONIES. The Pierce Brothers’ winning combo of gory horror action, smart humour and heartfelt emotion follows zombie slackers Mike (McKiddy) and Brent (Kidder) as they travel across country to find the former’s old girlfriend and love of his life. But will those nasty bounty-hunting agents with a secret agenda catch them before they do? As a zombieland Abbott and Costello, actors Michael McKiddy and Ross Kidder’s chemistry and timing are superb. And you’ll just love Markus Taylor as the lumbering ‘Cheese’ in this Road Trip of the Living Dead that’s hilarious fun and surprisingly sweet.